Rescue team at the Marwar coalfield. Photo from Syed Ali Shah's Twitter page. 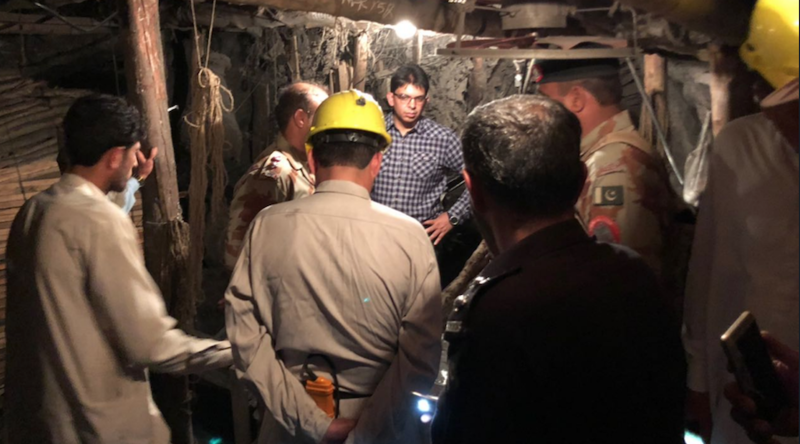 At least 16 miners died on Saturday and more than a dozen were trapped after an explosion in a mine in the Marwar coalfields in Baluchistan province, Director of Disaster Management Attaullah Khan said. A methane gas build-up inside the mine caused the blast, Khan said. Chief inspector of mines Iftikhar Ahmad said the rescue operation overnight pulled out 11 injured miners. He said two labourers died in a landslide on Saturday in another mine in Surrang coalfields. It was not immediately clear if that was caused by the explosion. "Rescuers retrieved five more bodies from this mine," he said. Another official, Mohammad Atif, said authorities had opened an investigation after sealing both mines. Accidents are frequent in the province's mines, where safety measures are basic and many in the workforce come from other parts of Pakistan. The Marwar and Surrang coalfields lie east of Baluchistan's capital Quetta. Writing by Asif Shahzad; Editing by Janet Lawrence.